Thrive Global Series B led by IVP; Marc Benioff joins Round; Funding to dramatically accelerate tech and product growth; Brent Chudoba appointed Chief Operating Officer and Chief Financial Officer. NEW YORK – November 29th, 2017 −​​ Thrive Global, the behavior change media and technology company founded by Arianna Huffington in November 2016, has raised $30 million in its Series B funding round to dramatically accelerate its technology and product growth and scale its impact around the world. The round was led by IVP, the multi-billion dollar venture capital and growth equity firm which has invested in, among others, Twitter, Snap and Slack. IVP General Partner Somesh Dash, who led the investment, will be joining Thrive Global’s board of directors. Joining IVP in the round is Marc Benioff, Chairman and CEO of Salesforce, and the Series B includes additional investment from existing investors including Lerer Hippeau Ventures, Greycroft Partners, Blue Pool Capital, Advancit Capital, Canvas Ventures, Female Founders Fund, Indigo Founder and CEO Heather Reisman, Oak Investment Partners’ Fred Harman, Bridgewater founder Ray Dalio, Michael Huffington and entrepreneur and philanthropist Sean Parker. Also joining the round as a new investor is Marketo co-founder and former CEO Phil Fernandez. 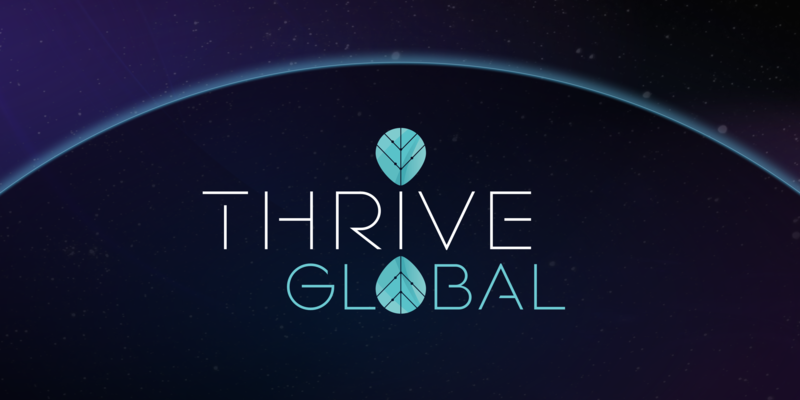 In its first year, Thrive Global has become the global market leader taking on stress and burnout by offering companies and individuals science-based solutions to enhance well-being, productivity, performance and purpose and create a healthier relationship with technology. a behavior change technology product suite that includes Thrive Global’s science-based Pathways, Journeys and Microsteps, as well as the Thrive App, launching in January to help us create a healthier relationship with technology, and ThriveAway, the vacation e-mail tool. Since its launch, Thrive Global has conducted over 200 live corporate trainings to improve well-being, productivity, engagement and retention in 26 countries, including China, India, Japan and Kenya. Thrive Global’s media platform reaches a total cross-platform audience of more than 20 million users and has built a community of over 15,000 contributors, ranging from experts in neuroscience and sports medicine to business leaders (including Jeff Bezos, Sheryl Sandberg and Richard Branson), celebrities (including Selena Gomez, Priyanka Chopra and Ashton Kutcher) and college students sharing their personal stories of how they succeed without burning out. Thrive Global has launched several dedicated editorial initiatives, including Time Well Spent with former Google design ethicist Tristan Harris about our relationship with technology, and The Fuel List, a branded partnership with Quaker Oats celebrating 20 new role models who are changing the way we fuel our minds and bodies to thrive every day. In addition, Thrive Global has launched a podcast in collaboration with iHeartRadio and Sleep Number that has featured guests ranging from Jennifer Aniston and Katy Perry to Neil deGrasse Tyson and Mark Cuban. On video, Thrive Global has produced multiple series including “The Long Game,” highlighting high-performance athletes’ well-being routines; “Turning Points,” featuring millennial women who changed their lives after painful wake-up calls; and “Live Better,” helping millennials set healthy boundaries in their relationship with devices and social media. Thrive Global has launched partnerships in India with the Times of India, and in Greece and Eastern Europe with the Antenna Group. The new funding will allow Thrive Global to scale its growth by developing digital behavior change products for the enterprise and consumer markets, building out its connected ecosystem of digital products while developing world-class data, analytics and measurement capabilities to provide users with personalized behavior-change interventions and demonstrate measurable ROI for corporations investing in employee well-being. Thrive Global will also be investing further in its video content production to deliver digital content across a range of formats, including premium series, short form, enterprise video and online training courses. Additionally, Thrive will be continuing its international expansion with new partnerships in China, Australia and the Middle East. Thrive Global continues to bring great talent to its ranks with the appointment of Brent Chudoba as its Chief Operating Officer and Chief Financial Officer. Brent is an experienced executive in both the B2B and B2C markets with responsibilities spanning product, tech, sales, finance and operations. Prior to joining Thrive Global, Chudoba was Chief Operating Officer of PicMonkey, the Seattle-based online photo editing and design service. Before that, he was Chief Revenue Officer at SurveyMonkey, where he worked closely with former CEO Dave Goldberg to help build SurveyMonkey into a $100M+ revenue business while maintaining profitability during his 6+ years at the company. And before that he was at the private equity firm Spectrum Equity Investors, where he was a critical part of the deal team that completed the acquisition of SurveyMonkey. With $7 billion of committed capital, IVP is one of the premier later-stage venture capital and growth equity firms in the United States. Founded in 1980, IVP has invested in over 300 companies, 106 of which have gone public. IVP is one of the top-performing firms in the industry and has a 36-year IRR of 43.2%. IVP specializes in venture growth investments, industry rollups, founder liquidity transactions, and select public market investments. IVP investments include such notable companies as AppDynamics (CSCO), Business Insider (Axel Springer), Buddy Media (CRM), Casper, Coinbase, Compass, Datalogix (ORCL), Domo, Dropbox, Dropcam (GOOG), Fleetmatics (FLTX), GitHub, HomeAway (AWAY), The Honest Company, Kayak (PCLN), Klarna, LegalZoom, LifeLock (LOCK), Marketo (MKTO), Mindbody (MB), Netflix (NFLX), Omniture (ADBE), Personal Capital, Pure Storage (PSTG), Rubrik, Slack, Snap (SNAP), SoFi, Supercell (SoftBank), Tanium, TransferWise, Twitter (TWTR), Yext (YEXT), ZipRecruiter, and Zynga (ZNGA). For more information, visit www.ivp.com or follow IVP on Twitter: @ivp.